In China, robocops patrol railroad stations. In South Korea, 85 bots were deployed for the 2018 Winter Olympics. In the US, they're on duty at some large malls. And, in Dubai, the world's "first fully operational Robocop" patrols malls, the airport and streets, fighting crime. We're living in the age of robocops. The emirate's goal is to make Dubai a top 5, smart-secure global capital. 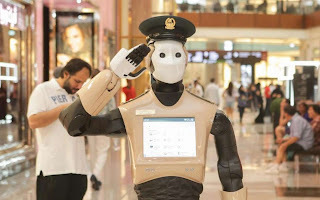 Robocop is the start of a big robotic and AI deployment by Dubai police. Robocop is life sized. It has face recognition technology and can ID wanted criminals 100 feet away. It can also collect evidence and patrol busy, crowded areas. It's part of the government's plan to replace human crime fighters with robots. By 2030, they plan to have robots comprise 25% of the police force. They also plan on having an all-robot, no human police station. You can report a crime to the bot. It has a touch screen on its chest for crime reporting. There's also an SOS button you can push to summon a human cop. And it's equipped with a mike that transmits directly to police call centers. It was manufactured by PAL Robotics of Barcelona. Google and IBM's Watson are said to have had input. There are plans for more Dubai robotic deployments in the next year or so. Police are going to dispatch what they call the world's largest robot, 10 ft. tall, that can run 50 mph. It's going to carry heavy equipment and will be controlled by a police officer in their cruiser. Also, egg shaped robots will patrol parking areas and issue warnings. And, drone motorcycles are also on the way. And, no, the Dubai Robocop isn't armed.